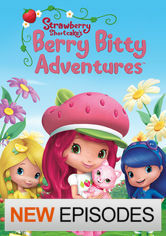 Join Strawberry Shortcake and her berry best friends in the whimsical land of Berry Bitty City, where they learn about teamwork and decision-making. Join Strawberry Short! cake and her berry best friends in the whimsical land of Berry Bitty City, where they learn about teamwork and decision-making.